Jenny with a whopper blue marlin! Kevin Wright and the boys display a blue! George McElveen wires a blue to bring in for a picture! Cousins Nick and Tiffany Stanczyk with a lunker blue! Sylvia Stanczyk and a blue! Sylvia Stanczyk catches a nice blue marlin, getting him ready to leader! Richard with a White Marlin on fly. Jimmy Jazz and Jose. White marlin caught on the... party boat? It happened! Our friend from Canada, Daryl Chronzy, with a big sailfish! A spearfish, very uncommon in the atlantic ocean! Richard Stanczyk and mate Jim Harris with a nice sailfish caught on flyrod! 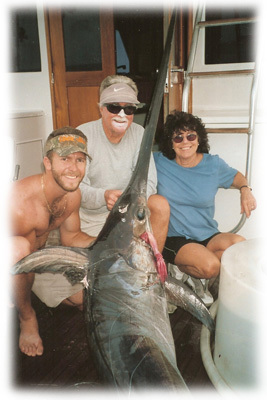 Angler Nick Stanczyk and Marc Ellis tag a sailfish for a release in the 1997 Jr. Sailfish tournament, which they won! Ricky and Nick Stanczyk display a nice sailfish with an angler! Great summertime catch! Great shot of a sailfish coming up in the water! This sailfish really wants to get away! Capt. Bill Bassett and Capt. Bill Chapman with their angler and a nice sailfish! Charter boat Sachem! Jack Siragusa's 1st blue marlin. est. 250 lbs off of Islamorada. Captains Rick and Nick Stanczyk with a nice atlantic sail prior to release on a charter! Captain Rick Stanczyk releasing a sailfish unharmed and reviving it back to life! Vinny caughth is first sailfish with Captain Rick Stanczyk in the Victoria's Secret Double D Cup tournament!